The Empty Stadium: NBC Olympic Broadcasting Fail? Last week, I noted some objections to the handling of Olympic broadcasting duties by NBC, the country's fourth-placed national broadcaster. Not mentioned in that critique was the placement of Sunday night's eventual "tremendously tremendous" hockey game between the USA and their rivals and hosts, Canada, on cable outlet MSNBC. What did the mother network show instead? The original dance portion of the ice dancing competition. produce some interesting costume choices. The action at Pacific Coliseum could not match the electric atmosphere in Canada Hockey Place, where over 19,000 watched the US take down Canada by a score of 5-3. 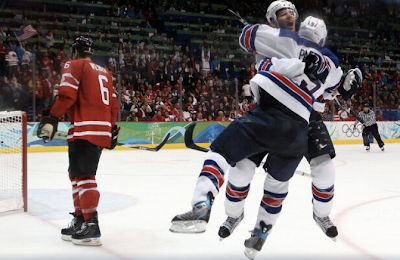 The win was the first Olympic Games victory for the US over their northern neighbors in 50 years (highlights). The historic quality of the event was matched by the incredible intensity of the game, the pressure on the Canadians to defend home ice, and the prevalence of skill among the two rosters full of top-level NHL talent. Canadian fans were looking forward to a celebration. 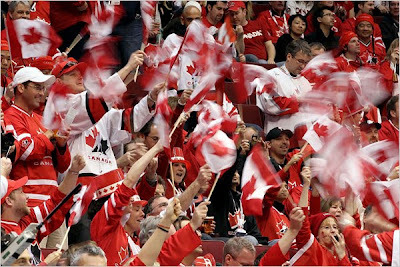 ESPN hockey analyst Barry Melrose, after the game, "I hope no one has to call Canada for anything tomorrow. There ain't gonna be anyone working." 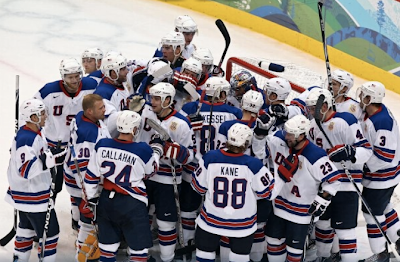 The result of the dramatic victory, which was backstopped by a 42-save effort from goaltender Ryan Miller, put the US team at the top of the tournament's preliminary round. Not only will the US get an extra day's rest - and a bye to the quarterfinals - they will avoid a potential meeting with tournament favorites Sweden or Russia. 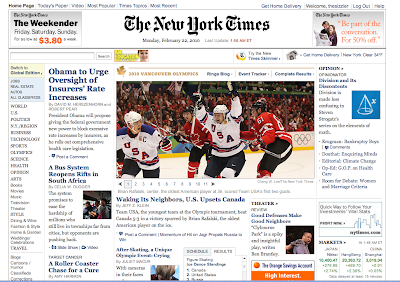 Sunday night's New York Times home page. 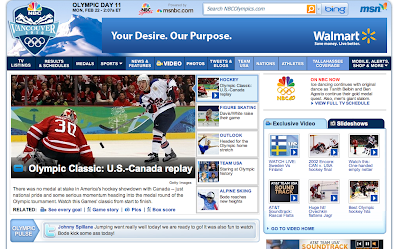 On NBC's Olympic home page. ESPN. 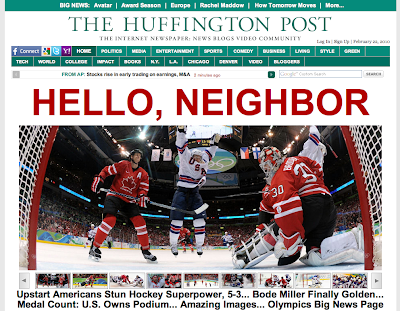 When's the last time hockey made the front page on the WWL? The political consequences of a US win? Good luck importing Canadian bacon. Or maple syrup. 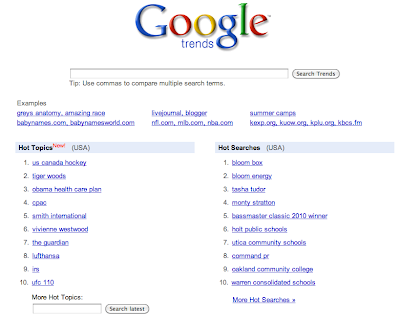 "US Canada hockey" was the top Google US search term on Sunday night. 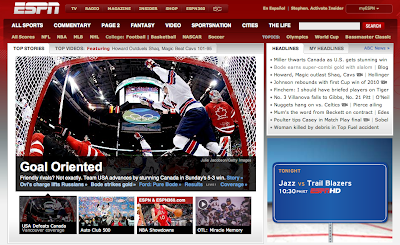 This all returns us back to the title of the blog post: why was the game on cable? The answer points to Sut Jhally's concept of the sports/media complex, where (among other things) sport is only as valuable for a network like NBC for its ability to deliver audiences to advertisers. This "complex" is fairly well-understood at this point, but was most recently made patently obvious by this month's Super Bowl (the highest-watched ever) and a Wall Street Journal report the previous week that showed an NFL broadcast contains just 11 minutes of action. Unfortunately for ice hockey, its games do not fit this model, especially in the Olympics when there are no TV timeouts - and no time for commercials - during the game. If you've been watching, you've noticed that when the whistle blows in an Olympic hockey game, there is no more than 15-20 seconds until play resumes (oftentimes after showing a brief commercial, MSNBC returns to game action that has already started). Therefore, it was clear that ice hockey games would not provide enough time for commercials and Bob Costas, apparently, to warrant NBC placing even such a "tremendously tremendous" sporting event on its national network (side note: NBC's opening segment on Monday night's Olympic coverage featured a live shot of Bob Costas landing in a seaplane. With Al Michaels narrating. Scintillating). or simply puzzled by the ice dancing scoring system? The whole affair is especially unfortunate considering that NBC currently has a broadcasting rights contract with the NHL and the Olympic Games would be a great way to market NHL talent. Ultimately, NBC rationalized their decision to put the hockey game on cable because ice dancing on the major network would have the ability to attract the coveted female viewer demographic. Relatedly, I find it equally reasonable that the network assumed they could not get the same amount of advertising revenue from hockey as compared to ice dancing. 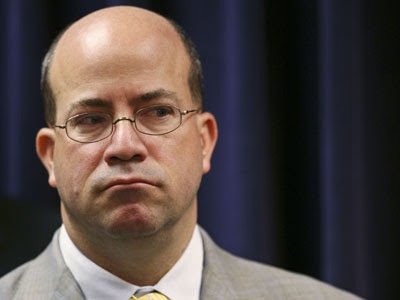 After the fact, the only question that remains is should the game have been on cable? We don't have the national numbers for NBC just yet, but MSNBC reported today that the hockey game delivered its second highest number of average viewers ever. With an 8.2 million average viewership, the game provided an audience number that was higher than all but John McCain's concession speech during MSNBC's coverage of Election Night 2008. Wow. The team celebrates a hard-earned win. Is there a win in the national ratings as well? Furthermore, reports from the local TV market in Buffalo, NY - albeit a devoted hockey town - showed that ratings for the game outdrew the ice dancing ratings. This happening is so rare - MSNBC beating NBC in evening ratings - that the Buffalo News mused, "Do you believe in miracles?" I'll update the national ratings as they come in. UPDATE: Sunday night, NBC averaged an national audience of 23.3 million, down 3 million from the ten day average of 26 million per night, but still good enough to dominate the other networks' offerings.